We all have lots of experiences when someone tried to get your WiFi connection and with that slowed down your connection speed and cost you money. That is why we wanted to share an amazingly useful wifi analyzer tool that will stop the WiFi thieves and protect your network. With an easy and clean interface and simple configuration, Home WiFi Alert – WiFi Analyzer is one of the best tool apps on the Android platform. With this app you will be able to scan your home network fast and find out who is using your connection. You will be presented with a detailed list of who exactly are the unwanted devices which are slowing the speed. You can set up an alert (vibration or a message) to notify you whenever someone logins on your home network. You will be given the exact IP addresses, host names, MAC addresses and even the manufacturer names. Also, you can make a list of trusted network, for example your family’s devices, and they will always be welcomed in there – you won’t be notified when they connect. Securing the router is a simple few steps process, just click on the link in the settings page and it will take you to your router’s admin web log in and there you will be able to configure the network settings. 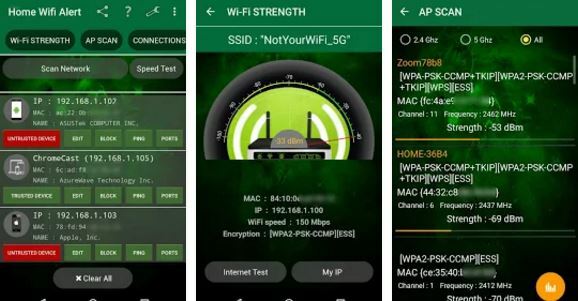 Take control over your home network with this marvelous WiFi analyzer, download it for free on Google Play.